Marc Cevasco worked in the Obama administration before joining Congressman Ted Lieu. 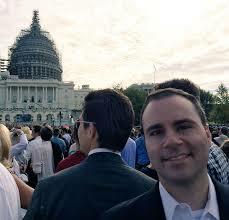 Marc Cevasco is the chief of staff for Congressman Ted Lieu who represents California’s 33 Congressional district. Today he talks about the Problem Solvers, a bipartisan caucus of moderate democrats and republicans. Problem Solvers say they won’t support Nancy Pelosi for Speaker unless she promises to change some procedural rules that, they claim, will get rid of gridlock.